In late May 2014, Gaurav Chandwani, successfully defending his MS IST Capstone at GCCIS Rochester Institute of Technology. Gaurav was a Graduate Research Assistant (GRA) working under two grants, NYSCA’s Mobile Experiences for Tourism Project and RIT’s Brick City Tours. Not only did Gaurav play a major role in developing front end interfaces, but he also help mentor newer GRAs as they joined the Blended Interactions Studio. Gaurav’s capstone is a combination of Information Sciences (e.g. front end iOS programming) and Human Computer Interaction (e.g. evaluation/usability testing). The summation of his MS capstone is a great example of Mobile User Experience Design. Collaborative photo sharing while visiting designations can be problematic for the visitors. Sometimes the best photo is on another person’s device. This MS IST/HCI capstone developed, designed and evaluated a mobile application prototype to explore location-based photo sharing for souvenir generation at heritage designations. Using user centered design methods, the application and its content catered to visitors on the Rochester Institute of Technology’s campus. 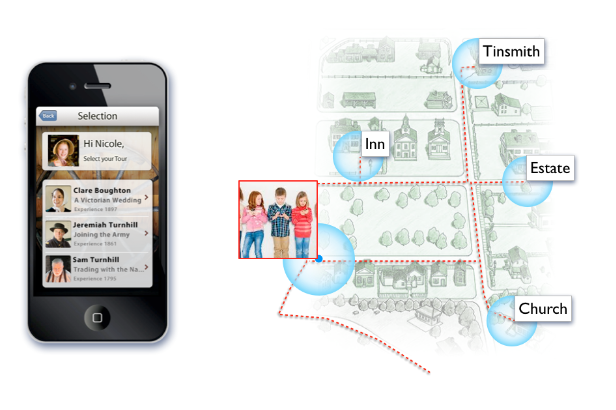 Application modules were developed to easily sync group photo collections together while friends were on a tour together. After the tour was complete, digital photo souvenirs were created to represent the group visit. Evaluations concluded that although automatic photo sharing was very positive utilitarian approach to group photo-sharing, the aesthetics of the souvenir prototype needed more iteration to represent the destination rather the group’s activities alone. On Wednesday May 7th, RIT MS HCI and Allendale Columbia School students and faculty ran our mobile pilot test at Genesee Country Village Museum. As pilot tests go, we ran into a few bugs. In particular, we run into bugs at geo-fences (a geo fence is a GPS coordinate with a mathematical virtual radius drawn around a latitude and longitude). When the physical visitor collides with this digital artifact, we deliver contextually relevant digital content to the visitor. After collecting these possibilities we brought them to our development team at RIT the next day. Out of all the potential problems it was “problems with the iOS code”. The development teams fixed the bugs to have a successful usability test on May 14th with school students from Syracuse, NY. On April 10th 2014, Rochester Institute of Technology (RIT) faculty and students, with a history specialist from Genesee Country Village & Museum (GCVM) met at Allendale Columbia School (ACS) to teach augmented reality production skills to schoolchildren. The goal of this workshop was to have schoolchildren produce their Heritage Stories they wrote from the previous workshop “Schoolchildren Design Mobile Visitor Experiences“. Schoolchildren were directed by RIT students from the School of Photography Arts and Sciences (SPAS). Film directors and photographers from SPAS recorded each schoolchild in front of a green screen so they could act out their individual role in each Heritage Story. For example, a child dressed as a blacksmith or a school teacher. GCVM provided 19th century clothing, so the schoolchildren would be contextually and aesthetically appropriate when we geo-locate their videos in our next workshop. RIT Interaction Design students and Allendale Columbia School faculty prepped and couched the schoolchildren before and during each augmented reality video shoot. This workshop gave schoolchildren hands on experiences in the augmented realty production process. In our next workshop, RIT and ACS students will process and geo-locate each individual video to curate physical locations with their Heritage Stories. Schoolchildren Designing Mobile Visitor Experiences at Heritage Destinations is a collaborative mobile user experience design project between Allendale Columbia School, Genesee Country Village & Museum and Rochester Institute of Technology (RIT). The goal of this project is to give schoolchildren the oppertunity to be designers of mobile technologies instead of consumers of mobile technologies. The mobile user experiences designed by the schoolchildren of Allendale Columbia School, will be evaluated by other schoolchildren participating in annual field trip events to Genesee Country Village and Museum in late spring 2014. This project leverages the mobile technologies designed and developed under a 2013 New York Council on the Arts Grant, Mobile Experiences for Tourism Project. In early December of 2013, seventeen fifth-grade school students from Allendale Columbia School were invited to experience the New York State Council on the Arts (NYSCA), Mobile Experiences for Tourism Project mobile prototype. Each student was between the ages of 10-11 years old and had been to Genesee Country Village & Museum in the past. Before the evaluation the 17 students were selected to be in groups averaging 2-3 students. Before the evaluation students were given a brief UI tutorial. During the evaluation, researchers shadowed the student groups. After the evaluation a short survey followed by a short interview was given. The survey contained 27 questions with a Likert scale from “strongly disagree” to “strongly agree” based on our design strategy. We presented statements relating to the heritage story, digital characters and user interfaces navigation. Our goal was to assess the school student’s enjoyment and if our interaction design strategy and decisions were substantiated. they would be interested in repeat visits if the mobile application gave seasonal narrations during the year (94%). Our evaluation also provided areas for design improvement. School students were mainly natural when taking the time to explore the individual locations e.g. Blacksmith Shop. The majority of students spent too much time looking at the mobile device while moving from location to location. These areas of improvement will help shape the next design iterations as we evaluate our strategy and heritage stories at GCVM. The results showed that school students would like to create their own heritage story (88%). We are collaborating with Allendale Columbia School students to deploy their own heritage stories at GCVM spring 2014. We have conducted workshops to investigate, design and evaluate mobile experiences for heritage storytelling. We will continue to evaluate the mobile prototype to inform our mobile user experience design decisions. Special Thanks to the students and faculty of Allendale Columbia for participating in the evaluation, and as always, thank you Genesee Country Village and Museum and Edinburgh Napier University. “Please no running…” School students sprinting to uncover the next clue. School students finds “Jamie’s Hammer”, an essential clue in the Heritage Story. Evaluation table aka break room at GCVM. Searching for clues in the Campbell House. Alice (leading digital character) leads the school children to the farm shed. Compass navigating school children through grassy knolls. On Thursday, November 21, 2013, MS HCI faculty and students from Rochester Institute of Technology (RIT) ran a collaborative workshop with 5th and 8th grade school students at Allendale Columbia School (ACS) in Pittsford, NY. The goal of our workshops are to create opportunities for school children to experience the interaction design process of cutting edge mobile technologies and services in the tourism and heritage domain. Rather than children being the consumers of mobile technologies, children will have the opportunity to design mobile experiences for heritage storytelling at tourism destinations in the greater Rochester area. We are using technologies funded under the New York State Council on the Art, Mobile Experiences for Tourism Project 2013. We are designing our mobile experiences around the heritage destination of Genesee Country Village & Museum. Schoolchildren Investigating Mobile User Experiences is the initial collaborative phase between RIT and ACS. This phase consists of investigation workshops aimed at providing experiential learning opportunities geared for children as our user-group. Our first investigation workshop included 50 children divided up into two sessions, 1-heritage storytelling and 2-digital souvenirs workshops. School students were asked in the first workshop to investigate how two places at a heritage destination could be related through narratives. The school students were given post-its and told to document all possible characters, settings, themes, plots and scenarios on a post-it. Then the school students were assigned to place any narrative configurations (of post-its) on the front board for an audience of their peers to critique. This allowed the ACS students creative freedom to develop stories they would like to see at GCVM, and permitted the researchers to educate the school students about creating heritage stories. A heritage story is a cinematic method to deliver digital content through digital agents, while creating continuity from point-of-interest to point-of-interest at a historical site. Heritage stories included a mystery story, a heroic story, and a horror story within the nineteenth century living history museum. For example, “The Mystery Story” involves a case of wrongful indictment. The town homeless character is falsely accused of theft. The real culprit is a wealthy land owner. GCVM visitors attempt to prove innocence while learning the moral lesson of “don’t judge a book by it’s cover.” Souvenirs from this narration include mockups of the stolen goods. During Spring of 2014, we will be iterating and creating multimedia assets into our system at RIT. School students will have first hand experience designing for location-based mobile technologies to deliver a narrative such as “The Mystery Story“. Our workshop collaborations will work into three phases: Schoolchildren (1-Investigating), (2-Designing), and (3-Evaluating) Mobile User Experiences at heritage locations in the greater Rochester area. Faculty and students at Rochester Institute of Technology are using mobile technologies to engage visitors of historical destinations in the Greater Rochester area. The mobile design strategy, called Brick City Tours, personalizes the tourism experience using digital storytelling, cultural heritage and interactive arts, such as augmented reality. RIT is collaborating with VisitRochester, Greater Rochester’s official tourism promotion agency, to design mobile experiences that personalize and capture tourists’ visits at the Genesee Country Village and Museum. The technology is also designed to scale to many of VisitRochester’s other top destinations. The Mobile Experiences for Tourism Project is made possible by the New York State Council on the Arts with the support of Gov. Andrew M. Cuomo and the New York State Legislature. Funding for the project comes from a $52,958 award from the 2012 Regional Economic Development Council Awards and a matching $52,958 contribution from RIT and VisitRochester. Blended Interactions is a user experience design studio at Interaction Design Program at SUNY Farmingdale State College. We are dedicated to the applied research and development of mixed reality and blended theory.